This salad is really versatile and can be served on it’s own as a starter, with a good variety of barbecued meats like the sirloin steak we had here or grilled mushrooms. It has a great balance of earthiness, sweetness and a salty freshness from the peppers and capers which match the pecorino cheese really well. Preheat the oven to 190ºC/Gas Mark 5. Toss the peppers with 1 tbsp of the oil and a little salt. Scatter in a roasting tin and roast for 35 minutes, or until soft and starting to colour. Remove to a bowl and cover with cling film. Leave to cool, then peel and cut into thick strips. Whisk together the marinade ingredients: 2 tbsp of the oil, the balsamic vinegar, water, sugar, thyme, garlic, and some salt and pepper. Pour this over the peppers and leave aside for at least an hour or overnight in the fridge. 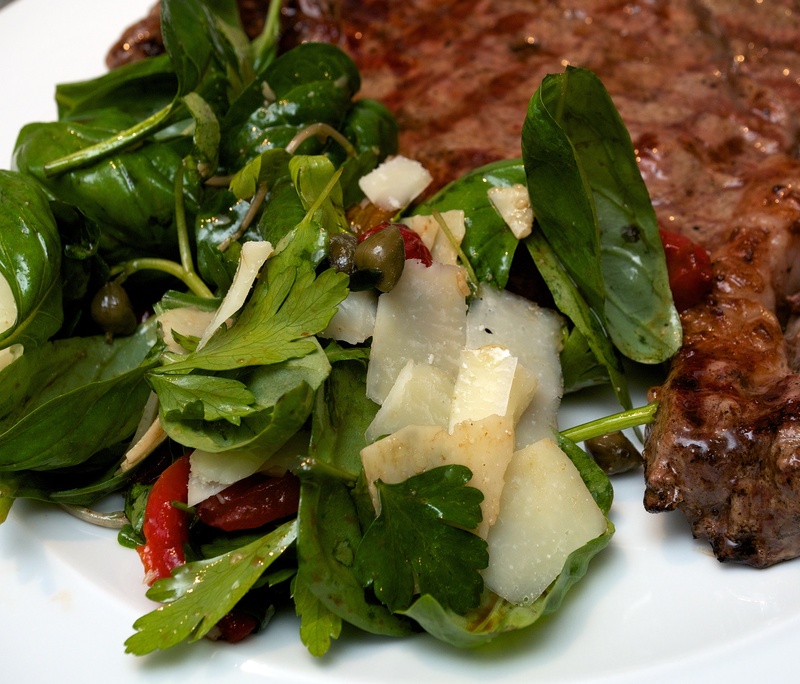 When ready to serve, toss the herbs, watercress, drained peppers, pecorino and capers together. Add the last tbsp of olive oil and 1tbsp of the marinade. Season to taste. We will definitely do this recipe again; the flavours burst in your mouth and taste so summery. 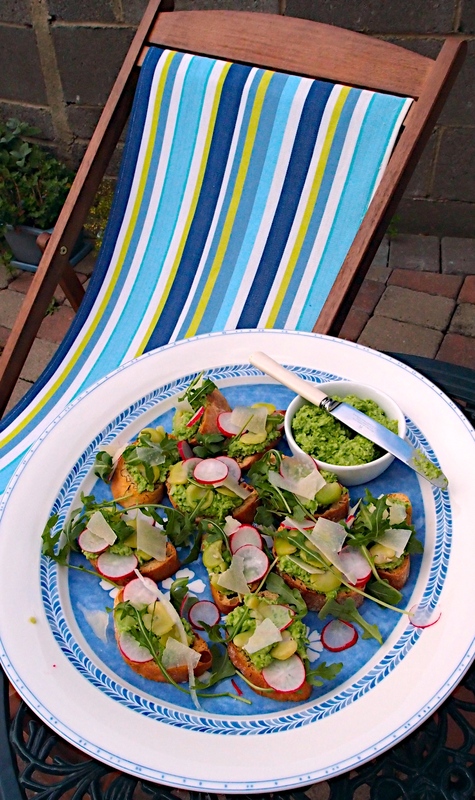 Our inspiration was our friend Carol who had some pea puree with radishes at a lovely Sunday lunch recently and Sheila from Gimmetherecipe posted a similar recipe and reminded us to try it. Such an easy summer starter. Cook the broad beans for 4 minutes until just tender. Drain, , cool under cold running water, then drain and set aside. In the same pan, fry the peas in half the butter until just cooked. Allow to cool, the blitz in the food processor (or use a hand blender) with the yogurt, mint and seasoning. Heat the oven to 180C/160C fan/gas 4. Melt the rest of the butter in a small pan, stir in the dill, then brush over the ciabatta slices. Bake for 10-12 minutes until crisp and golden. 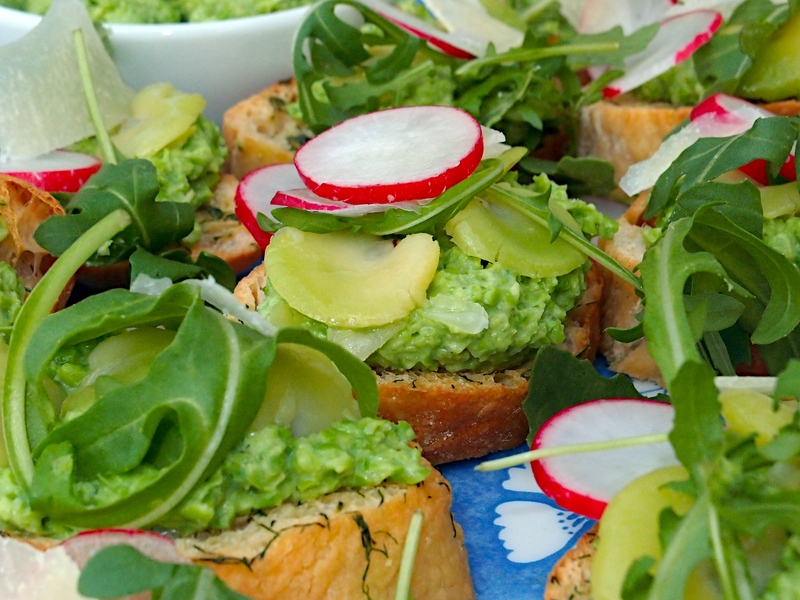 Spread some pea purée onto each slice, top with rocket, broad beans and radishes. Shave some pecorino over the top. Drizzle with oil before serving.